Views from Tuscan Drawing Excursions 2017! Italian style breakfast with fresh fruit, yogurt, eggs, and some granola delights brought by the Briel gang. I swear there was not a morning where these two were not laughing. Even before the coffee. Testing out our pencils and the different types of lines/values they can make based on the quality of the graphite. Day 1 was really about exploring how to make lines in a way that feels different for us, and training ourselves to hold/think about the pencil as a tool that can make a wide range of marks. We moved to the Arno, where we had a chance to draw an incredibly beautiful and diverse tuscan environment (urban architecture mts. distant tuscan horizon mts. overgrown waterfront). Students started with blind contour work, and moved on to "rapid-looking," where they were only allowed to look down at their paper for 1 sec at a time. This forced them to keep their eyes connected to the subject that was in front of them, and looking at it closely, instead of "inventing" what they think it looks like. Group chat about the Rapid-looking process. Dinner at a favorite spot in Oltrarno - Al Tranvai. Try the Baccala!! Fiesole is the suburb just above Florence, 30 minutes outside the city center. It's a peaceful reprieve from the city, with incredible views from the hilltop. It's also the perfect place to work on our next drawing lesson: Value + Space! On our second drawing day, we jumped into drawing space using charcoal. This is a particularly tricky medium, as it can be tough to control, but it's an excellent way to learn about "mass." Students wiped down their sketchbook paper with vine charcoal to make a 50% gray. We were sitting in an excellent value scenario with big, blocky, trees casting dark shadows. I had students look for shapes of light and pull them up with their eraser. Once they had this "map" they could build in darker-darks with their compressed charcoal. Pulling up the lighter areas with the eraser. Day 2 dinner was in an artist studio! Our artist-in-residence was Zanbi Lofti, an amazing painter and Florentine local for more than 15 years. Christine helped us transform the studio with the work of other artists from this shared studio collective. Me and Zanbi and the amazing work of Aryan Ozmaei! Table is set and ready for our guests. Zanbi talks about the dishes she has prepared for us, and her relationship to Florence, which she came to 15 years ago from Iran as a student at the Academy. It's not dinner without tiramisu. 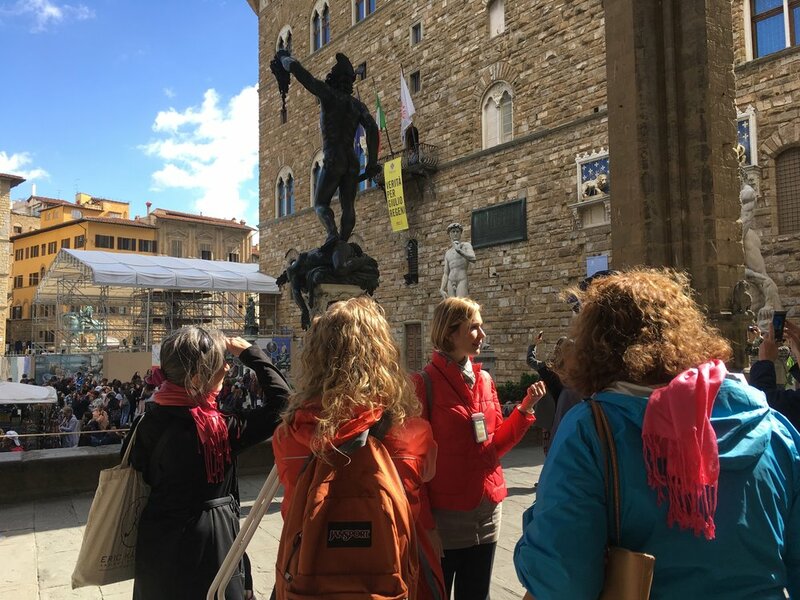 We started our 3rd day in Florence with a guided tour of the city center with art historian, and Florence native, Costanza. She gave us the lay of the land on Florence's urban plan, and what this unique city structure says about Florentine values and cultural heritage. Costanza took us to Santa Maria Novella church, an important place for the study of perspective (our drawing lesson of the day). Architecturally, the church is pretty wild, and (for all you art nerds out there) it contains some major linear perspective Renaissance masterworks including Masacio's Trinita. Our day 3 challenge was definitely a big one, with the Santa Maria Novella church and cloisters. I had students break-down this complex scene by looking at it through the viewfinder. This little paper frame helps them see where things meet in space, and what is/is not part of their composition. Based on the laws or linear perspective (which we just learned about with our guide, Costanza), we see that the tops of the SMN church arches are going down, while the bottoms of the columns are going up, as the two things recede in space toward the vanishing point. Side note: how adorable do they look with those viewfinders? Masacio's Trinita - the first painting to ever demonstrate the laws of linear perspective! The archways of the Santa Maria Novella Cloisters. A major perspective challenge. Drawing of the Santa Maria Novella Cloisters by Frances Ranno. Drawing of the Santa Maria Novella Cloisters by Lauren Briel. Mary - the life of the party! A fantastic meal at Casalinga - a can't-be-beat Florence classic. 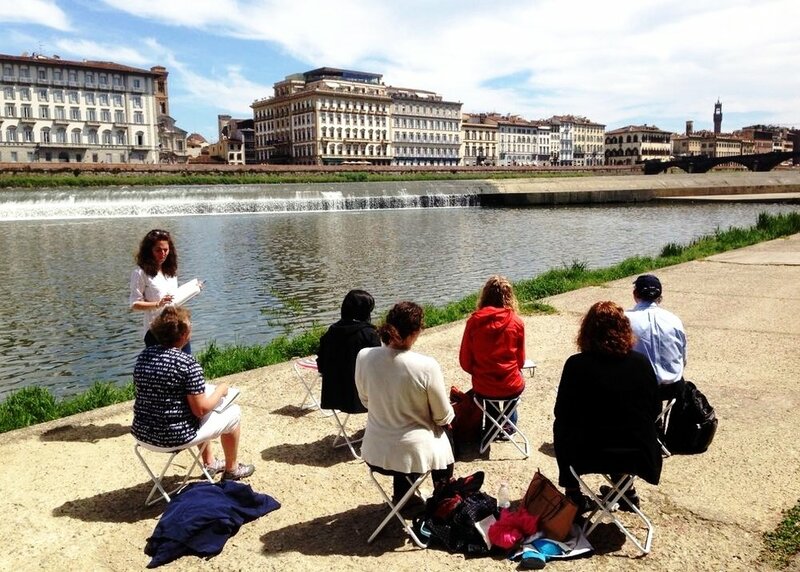 Our 4th drawing lesson took place in the Oltrarno (or the other side of the Arno river), where the students were based for the week. We started in Santo Spirito Piazza in the middle of the morning market. Students were challenged to draw the famous facade of Santo Spirito church, which using the rules of perspective (which they just learned), to give the space context. Our next stop was a secret garden in the University of Florence's research center. We were dealing with the same challenges of representing distant architectural space, surrounded by varied organic matter. Integrating both pencil and charcoal methods to find the right technique to describe the space. Pizza at Riva D'Arno, a riverside favorite. Hits the spot after a productive morning. We saved the best for last on this trip, with our visit to a Tuscan villa and vineyard on Day 6. We were the very lucky guests of Fattoria Le Masse, a family run business in the small Tuscan town, Barberino val D' Esa. We started our day with a drawing session in the Medieval village center, where students had a chance to warm up and acclimate to an environment that was a bit different than Florence. We were then met by our hosts Robin and Cristiana, who gave us a tour of their olive oil press and later the grounds of their centuries-old property where they make their chianti. And Ohhhhh they make a mighty-fine wine. Drawing at the village chiesa, underneath which, the olive oil is made. Christine is very excited to eat that cheese. Where the wine magic happens.